Development and manufacturing company.Antiwrinkles - Development and manufacturing company. Development and manufacturing company.Antiwrinkles - Development and manufacturing company. ascorbic acid (3-o-ethyl- ascorbic acid) and idebenone. 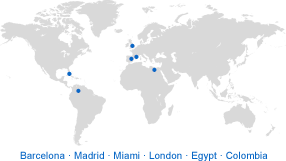 Peptides: Hexapeptide-8, Hexapeptide-10, Tetrapeptide (relistase), Tripeptide-38,�Oligopeptide-24, Decapeptide-4, Acetyl Decapeptide-3, Hexapeptide-48, Copper tripeptide-1, Palmytoil Tripeptide-28. Fill in the form below to access all information about this product. The product gets the improvement and effacement of wrinkles, from fine to medium wrinkles. The mechanism is base on properties as a cell adhesion by boosting lamining-5 synthesis and induction of the dermis density. Also it protects connective tissue under the skin that collapses during aging process and mediates wrinkles outcome. Also it has potent antioxidant attribute thus reduces wrinkle and gets down hyperpigmentation. Increases collagen and elastin synthesis, generates new skin cells and it is shown great increase of epidermis and dermis thickness and also subcutaneous fat. In addition it has antiapoptosis skin cells effect and it has been demonstrated the significant rise of hyaluronic acid levels reflecting a positive regulation synthesis pathway. As it acts over muscle skin acetyl choline receptors, this product is able to ease and relax muscles skin and then improves any wrinkles appearance. The result is a measurable improving of skin compactness and elasticity allowing the skin to be stretchy and resilient. The skin looks firmer, tighter and with nice attenuation and effacement of wrinkles. Note: These are advisable therapeutic uses, but the ingredients of products may allow a physician to apply them under professional criteria, may find the product optimal to treat other aesthetic issues. The acute skin-firming effects of DMAE have been confirmed by quantitative measures of cutaneous tensile strength. Although its mechanisms of action in the skin remain to be elucidated, evidence suggests that the skin is an active site of acetylcholine synthesis, storage, secretion, metabolism, and receptivity. Muscarinic acetylcholine receptors have been localized to keratinocytes, melanocytes and dermal fibroblasts, whereas nicotinic acetylcholine receptors have been found in keratinocytes. DMAE is an analog of the B vitamin choline and is a precursor of acetylcholine, the firming action of DMAE is explained by the fact that its molecule, considered to be a precursor of acetylcholine, alters muscle contraction. The benefits of DMAE in dermatology include a potential anti-inflammatory effect and a documented increase in skin firmness with possible improvement in underlying facial muscle tone. It is demonstrated the activity over muscle fibers improving their firmness and thus gives tone to the skin. First and foremost, alpha lipoic acid is a potent antioxidant that may be able to fight free radicals on the surface of the skin. Second, it has a moderate anti-inflammatory effect which can be made use of to soothe the skin. The anti wrinkle effects of alpha lipoic acid have been studied in a clinical setting. These studies have shown that high concentrations of alpha lipoic acid can help mild wrinkles and fine lines disappear, over time. The appearance of prematurely aged skin. This phenomenon is characterized by progressive alteration of the dermal extracellular matrix, including elastin and collagen fibers. While many cosmeceuticals claim to improve the appearance of photoaged skin, due to the ability to induce molecular responses associated with wrinkle effacement, particularly increased collagen production. Due to its probed antioxidant property reduces the outcome of fine wrinkles also gets down hyperpigmentation and enhance skin firmness and elasticity. On the other hand it shows excellent hydratation attribute. Improves cell adhesion by enhancing synthesis of laminin-5. Adhesion of cells to the basement membrane and among themselves provides firmness to the skin and then wrinkles free appearance. Increased contact between skin cells ensures correct nourishment and health. Induces a significant increase in dermis density, improving skin compactness. The aminoacid composition of this peptide helps to restore skin’s natural elasticity, which causes skin to look firmer, tighter, and less wrinkled by protecting elastin in the cells, allowing them to rebuild and stay stretchy and resilient. It can even help protect connective tissue under the skin, which also begins to collapse during the aging process. 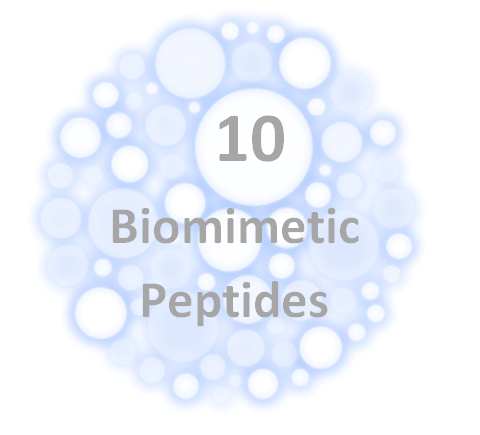 Another of benefit of this peptide is its ability to encourage collagen production. A stabilized peptide engineered for cutaneous delivery that is resistant to enzyme degradation. It mimics TGF-β β by activation of the transforming growth factor-ββ receptor Type II (TβRII) to activate collagen synthesis. In consequence, it reduces wrinkles by increasing collagen in the skin. It works by turning on the gene responsible for the production of collagen. Reduction in wrinkles in 28 days (In-vivo). Increase in Collagen I Synthesis (in-vitro). Increase in Collagen III Synthesis (In-vitro). This peptide will affect the six major structural components of the skin to stimulate collagen and diminish or even prevent fine lines, increase hydration levels, and protect and repair damaged skin. The dermal-epidermal junction (DEJ) is where the epidermis, the top layer of the skin, meets the dermis, the lower layer of the skin. There is no blood flow in the dermis, so it relies on the epidermis for nourishment and protection. The epidermis sends efficacious ingredients from skin care products to the dermis through collagen channels. This peptide strengthens collagen; thereby, enhancing the communication between the epidermis and dermis. This attribute helps to create a fresh, youthful and glowing complexion. Reduces and prevents lines and wrinkles by actively generating new skin cells. Involves in normal skin growth, healing and wound repair. Strengthens skin elasticity by inducing the synthesis of collagen and elastin. More stable and prolong action than native proteins. It has showed positive regulation of collagen expression. Increases fibroblast cell and keratinocyte cell proliferation in dose-dependent manner. This olygopeptide shows great effect anti-wrinkle and skin tightening. 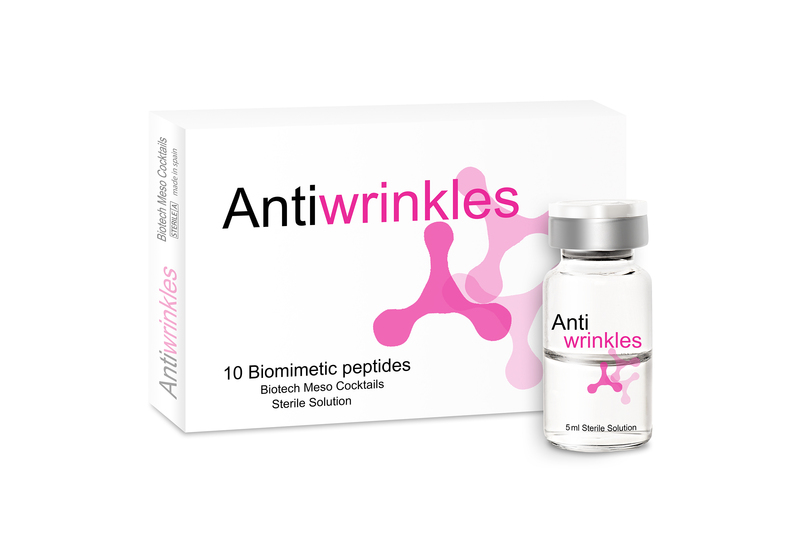 Proven anti-aging and wrinkle smoothing peptide. GHK-Cu increases the thickness of the epidermis and dermis, increases skin elasticity, and reduces wrinkles, resulting in a removal of skin imperfections such as blotchiness and sun damage marks, while producing a significant increase in subcutaneous fat cells. It has been demonstrated, this molecule strengthens skin elasticity by inducing collagen and elastin synthesis. Reduces and prevents lines and wrinkles by actively gernerate new skin cells. Cell attachment is essential for cells survival and this peptide shows great cell attachment enhacement. Promote skin elasticity by inducing the synthesis of collagen and elastin. Reduce and prevent lines and wrinkles by actively generating new skin cells. Hydrate dry skin and maintain its optimum moisture balance. Minimize scars on skin by forming new skin cell. 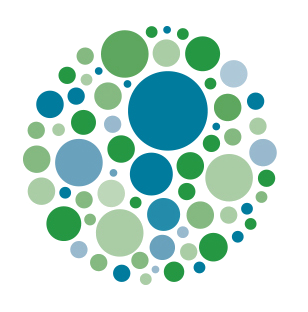 Up-regulation of cell growth and migration, cell survival and extracellular matrix expression. Increased fibroblasts and keratinocytes proliferation in dose-dependent manner. It has showed positive regulation of Hyaluronic acid and Fibronectin expression. Increased expression of hyaluronic acid (3 folds) and Elastin (1.3 fold) was observed in dose-dependent manner in fibroblast cell. This molecule increases cell survival of keratinocytes cell line by its anti apoptosis attribute, also enhances the attachment of cell by means of EGF growing epidermic factor regulation. Argireline is a unique new peptide that both reduces the degree of existing facial wrinkles and has been demonstrated effective against their development. It’s been shown to inhibit the formation of the SNARE complex as well as catecholamine release. These inhibitions confer anti-aging activity on Argireline; they closely relate to the basic biochemical mechanisms of wrinkle formation. Controlled studies have also demonstrated that facial wrinkle depth can be reduced, especially in the forehead and around the eyes, and that Argireline can prevent apparent facial skin aging. Skin topographic analysis performed on healthy female volunteers confirmed the validation of the proposed biochemical mechanism of action. They should be done by the supervision of a doctor or a registered nurse and they will apply the best technique available in each case. The product is developed sterile, preservative free and pyrogen free to be used on several aesthetic techniques, IPL, roller and other invasive or non invasive procedures.